It wasn’t over until it was over. 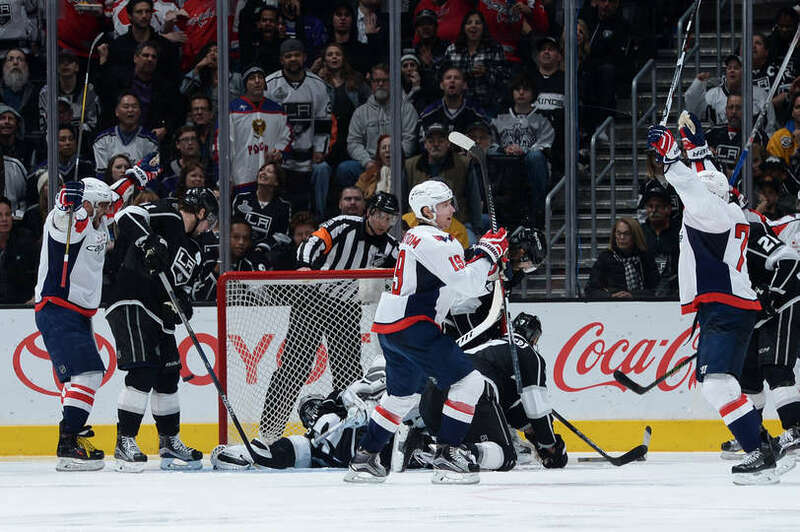 The Washington Capitals continued their recent string of bad starts and furious finishes, coming from three goals down to salvage a point against one of the better teams in the Western Conference, the Los Angeles Kings. Jeff Carter’s goal at 2:50 in overtime dealt the Caps a 4-3 loss that for many might have felt like a win. T.J. Oshie, Nicklas Backstrom and Dmitry Orlov — in spectacular fashion — scored three third period goal to forge a tie and carry the game to a frenetic overtime period. Or half of an overtime period, as it was. The Caps improve to 49-13-5 for 103 points on the season. As the Caps did for Brooks Laich last week upon his return to Verizon Center, during the game, the Kings played video tributes to both Justin Williams and Mike Richards, members of the ’12 and ’14 Cup-winning teams for Los Angeles, to standing ovations from the Staples Center crowd. The first period could not have gone much worse. The Capitals, in the midst of a four-game road trip, were thoroughly outplayed. The Kings (38-19-9, 85 points) scored three times, outshooting their visitors 14-6 in the process. Old nemesis Vincent Lecavalier opened the floodgates, scoring just 4:52 into the contest on a power play with Jay Beagle in the box for tripping. Alec Martinez’ shot from the point deflected off several players’ body parts, the last being Lecavalier’s skate before slipping past Braden Holtby. Jake Muzzin’s weak wrist shot, coming from the wing off a three-on-two. was whiffed on by Holtby with the glove to make it 2-0 at 12:05 of the first. Barely a minute later, Karl Alzner got caught pinching in the offensive zone, and another odd-man rush sent Milan Lucic in with Carter. The power forward tipped in Carter’s pass on the three-on-one to make it 3-0 after one. Neither team scored in the second period, which saw both teams register seven shots on goal. That third period though. Whoa. Oshie got the Caps on the board on a power play 1:46 into it, giving the team some hope on a night to that point was devoid of it. Oshie collected a bouncing puck — originally shot from center point by Matt Niskanen, then whacked at by Backstrom — and with Jonathan Quick down, calmly picked a spot and threaded the needle for his 20th of the campaign. Backstrom got his midway through the period, again on a rebound. Oshie circled through the slot and found Alex Ovechkin (assist, 4 SOG, 4 hits) with a slick pass. Ovechkin’s second shot pulled Quick out of the goal and the rebound came to Backstrom and an empty net for his 18th of the season to make it 3-2. It stayed that way until the 16:38 mark. Orlov took a drop pass from Justin Williams at the top of the slot, weaved his way through the Kings vaunted defense, put it on his backhand and flipped it past Quick for his eighth of the year to knot it at 3. The Caps outshot the Kings in the third period 18-6. Befitting of Hollywood, the extra session was Fast and Furious. At three-on-three, it was back and forth with both teams receiving quality opportunities. The Kings had the last though, as Lucic found Carter with a cross-ice pass and Carter lifted past an outstretched Holtby (27 saves) for the winner. NEXT GAME: It’s on to San Jose, for the last of the west coast swing on Saturday at 10:30 Eastern.